The Academic Resource Center (ARC) encourages students to begin preparing for the end of the semester now. Students should make their testing, tutoring, and writing appointments well in advance to ensure that they get the assistance they need. 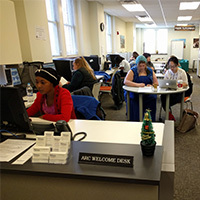 The ARC is also a great place to access computers, printers, and other resources and to study and complete assignments. All ARC services will be available through finals week, May 6-10. Testing Center hours are 9 a.m. to 7 p.m. Mondays through Thursdays and 9 a.m. to 4:30 p.m. on Fridays. Tutoring Center hours vary based on peer tutors’ availability. Please check the schedule at www.webster.edu/arc for details. Please always keep in mind that tutors in additional subject areas are available by appointment. Contact Carolyn I. Brown, assistant director, at 314-246-7668 or tutoring@webster.edu to inquire about by-appointment tutoring. Writing Center hours are 9 a.m. to 7 p.m. Mondays through Thursdays and 9 a.m. to 4:30 p.m. on Fridays. Weekend Writing Center hours are held from 1-4 p.m. Saturdays and Sundays in the Webster Library. Specific scheduling details may be found online at www.webster.edu/arc.